You can set a time budget for each task. This will help you monitor your team’s performance and properly judge task’s profitability on an ongoing basis. Task’s progress can be easily compared by generating the proper report or in task’s single report view. To set a budget for project or task go to Project Management page and click on the desired task. Find the Budget section in the edition panel. Enter a preferred value for ‘estimated hours’ or “estimated fee”. Keep in mind that if you have subtask(s) added, time spent on them will count to estimated time. If subtask have their own estimated time, those values will add to the parent task. In example, if Task A has 20 hours of estimated time and its subtasks B and C have their own estimation set to 5 a piece, the total estimation for Task A would be 30 (20+5+5). 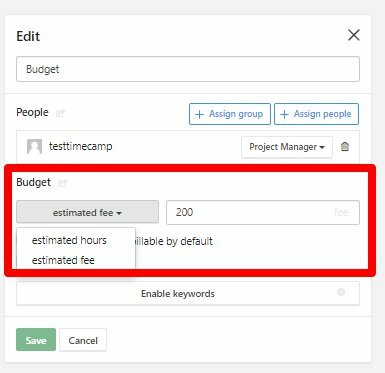 TimeCamp will automatically notify you via email when time budget for your tasks is either exceeded or nearing exceeding (80% of time is tracked). You can quickly compare tracked time with the budget by generating proper Report. Simply select the Estimates report.